. : Optics & Photonics Focus :: Magnetic Break Up :. The proton, one of the building blocks of matter, is considerably smaller than previously measured — latest studies suggest. This result may well challenge our current understanding of nature. Pyrochlore lattice. The pyrochlore lattice is a crystalline structure formed by a network of corner-sharing tetrahedra. The magnetic moments reside on the vertices (red points) and always point towards the center of a tetrahedron. The minimum energy arrangement is the one in which two spins point into and two spins point out of each tetrahedron. The flip of a spin generates two magnetic charges that are then free to wander around the crystal independently of each other. Positive and negative electric charges are solo players that enjoy strolling around independently of each other. North and south magnetic charges, by contrast, are more cooperative, to the point that they are always found in couples; at least this is what we would have thought until only a few months ago. Now, a wealth of independent experiments from various groups have shown that under the appropriate conditions, even this very conformist couple can be persuaded to separate. Four different groups have managed to experimentally detect such magnetic monopoles. These groups were led by: Steven Bramwell at the University College London (UK) together with Sean Giblin at the ISIS Facility (Rutherford Appleton Laboratory, Oxfordshire, UK); by Thomas Fennell at the Institut Laue-Langevin (Grenoble, France); by Jonathan Morris from the Helmholtz-Zentrum Berlin für Materialen und Energie (Germany); and by Hiroaki Kadowaki at Tokyo Metropolitan University (Japan). There are several reasons for the physicists’ quest for magnetic monopoles. The existence of a cosmic magnetic monopole — a magnetic monopole that exists in vacuum as an actual particle — was postulated by Paul Dirac to explain the quantization of the electric charge and it is also a basic prediction of the grand unified theories, which promise to unify electromagnetic, weak, and strong forces. However, the main reason may simply be that symmetry holds a distinguished place in the heart of any physicist — and why should there not be the magnetic equivalent to the electric charges? The researchers have not found such cosmic monopoles, but they have certainly found the best earthly approximation to date: quasiparticles that live inside special materials known as spin ices and carry north- or south-magnetic monopoles. Unlike the two poles of a magnet, such monopoles can move independently of one another inside the spin ice for long stretches of time before recombining. As a matter of fact, they can generate real magnetic currents in the presence of a magnetic field, in the same way that electric charges can generate electric currents in the presence of an electric field. "Spin ice was discovered and named by myself and Mark Harris," explains Bramwell. 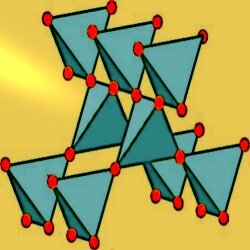 Back in 1997 , they discovered that the pyrochlore titanate (Ho2Ti2O7) crystal presented unexpected magnetic properties. The pyrochlore lattice is a network of corner-sharing tetrahedra, a quite complex structure, a sketch of which is shown in the figure. The problems, and these interesting magnetic properties, arise because such crystal geometry is incompatible with a minimum energy alignment of the magnetic moments, which reside on the vertices of the pyrochlore lattice (the red point in the figure) and which always point towards the center of a tetrahedron. The minimum energy arrangement is the one in which two spins point into and two spins point out of each tetrahedron. This is analogous to the arrangement of hydrogens in water ice. "That's why we called it spin ice," remarks Bramwell. The analogy between spin ice and water ice can be carried further. The basic water ice unit is the water molecule [H2O], which is formed by an oxygen atom and two hydrogen atoms and is electrically neutral. Sometimes, however, the water molecules steal some hydrogen from one another. This leads to two defective molecules: a positively charged molecule with three hydrogens [H3O+], and a negatively charged one with only a single hydrogen [HO-]. "We realized in 1997," recalls Bramwell, "that thermally generated defects in spin ice were analogous, in a positional sense, to ionic defects in water ice." Indeed, sometimes a magnetic spin flips, so that a certain tetrahedron has three inward spins and another nearby tetrahedron has only one. This originates two magnetic charges that are then free to wander around the crystal independently of each other. "What we didn't realise until much later was that they are equivalent at the level of electrodynamics," adds Bramwell. "This was suggested in the beautiful theoretical Nature paper by Castelnovo, Moessner and Sondhi, 2008." This work  argued that the spin ice defects are indeed magnetic monopoles, in the same way that water ice defects are electric charges, and it triggered the race to measure experimentally such magnetic monopoles. Indeed, it was the starting point not only for Bramwell’s experiment, but also for Morris’, Fennel’s and Kadowaki’s experiments. "Two of our co-authors, Alan Tennant (HZB) and Santiago Grigera (then at St. Andrews University), had started to work on the spin ice Dysprosium Titanate before the theory paper was published," explains Morris, "they then realised that we had the perfect opportunity to test the monopole idea, and so work started soon after that. […] Castelnovo and Moessner joined us once they saw our neutron results and the heat capacity data which they were able to explain within the monopole picture." "We had been working on spin ice for a long time," adds Fennel, "and when they came up with their theory we of course tried it out." "In January 2008," notes Kadowaki, "I read the paper by Castelnovo […] and quickly decided to perform a neutron scattering experiment." The far-reaching implications of the discovery of the magnetic monopoles are not yet clear. Looking many years into the future, we might even imagine the emergence of magnetronics, a brand-new discipline harnessing the magnetic charges and currents in the same way that electronics deals with electric charges and currents. When asked whether such magnetic version of electronics will be feasible, Bramwell is cautiously optimistic: "in principle yes, but it is a long way off. In spintronics people like to manipulate domain walls — but in only one dimension, and these are huge objects compared to spin ice charges. The spin charges are probably the smallest magnetic discontinuities that can occur, and they move in three dimensions. Thus we need big technological strides to exploit them, but to do so would be a challenge for the future. […] There is some progress on artificial spin ice magnetic arrays, but it is early days. The charges, conceivably, could be used for storing and transporting information." "It could be possible," agrees Morris, "that separating fractions of electric and magnetic charge may have technological applications in areas such as spintronics.” “From a technological point of view," comments Kadowaki, "the monopole in spin ice is, at present, not ready to be applied. However, similar phenomena can happen in other systems, such as in artificial spin ice. Moving monopoles, in such systems, may generate electric fields that are applicable to some devices." Regardless of any possible technological outcome, the experimental demonstration of the existence of magnetic monopoles in spin ice has an intrinsic beauty that stems from re-establishing a long sought-after symmetry between electric and magnetic phenomena. As Bramwell likes to put it, "these spin ice charges are like the poles of a magnet, but atom-sized and free to move. This latter property of magnetic charges was not anticipated at the time, and a revision of textbooks would be appropriate here." M. J. Harris, S. T. Bramwell, D. F. McMorrow, D. F. Zeiske & K. W. Godfrey, Geometrical frustration in the ferromagnetic Ho2Ti2O7, Phys. Rev. Lett. 79, 2554-2557 (1997). C. Castelnovo, R. Moessner & S. L. Sondhi, Magnetic monopoles in spin ice, Nature 451, 42-45 (2007). T. Fennell, P. P. Deen, A. R. Wildes, K. Schmalzl, D. Prabhakaran, A. T. Boothroyd, R. J. Aldus, D. F. McMorrow & S. T. Bramwell, Magnetic Coulomb Phase in the Spin Ice Ho2Ti2O7, Science (2009) 326, 415 - 417 (link). S. T. Bramwell, S. R. Giblin, S. Calder, R. Aldus, D. Prabhakaran & T. Fennell, Measurement of the charge and current of magnetic monopoles in spin ice, Nature (2009) 461, 956-959 (link). D. J. P. Morris, D. A. Tennant, S. A. Grigera, B. Klemke, C. Castelnovo, R. Moessner, C. Czternasty, M. Meissner, K. C. Rule, J.-U. Hoffmann, K. Kiefer, S. Gerischer, D. Slobinsky & R. S. Perry, Dirac Strings and Magnetic Monopoles in Spin Ice Dy2Ti2O7, Science (2009) 326, 411 - 414 (link). Hiroaki Kadowaki, Naohiro Doi, Yuji Aoki, Yoshikazu Tabata, Taku J. Sato, Jeffrey W. Lynn, Kazuyuki Matsuhira & Zenji Hiroi, Observation of Magnetic Monopoles in Spin Ice, Journal of the Physical Society of Japan (2009) 78, 103706 (link).